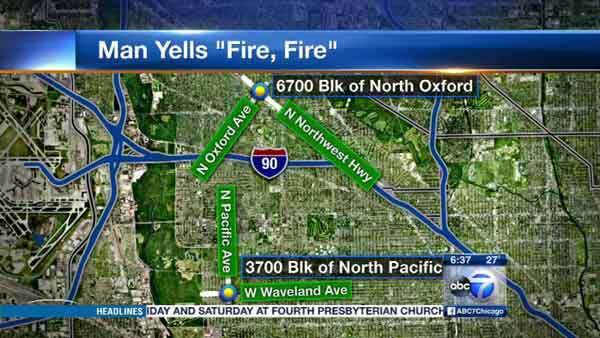 CHICAGO (WLS) -- Police are warning residents of a pair of home invasions on Chicago's Far Northwest Side. Authorities said a man broke into two homes, one in the 3800-block of North Pacific Avenue around 1:20 p.m. on Jan. 19 and one in the 6700-block of North Oxford Avenue around 2:50 p.m. on Jan. 21. In each incident, police said the suspect forced his way through the front door, yelled, "Fire! Fire!" and ran out. The suspect then got into a dark-colored vehicle driven by someone else and took off. Police said it could have been a four-door Ford F-150 with a chrome grill. Authorities describe the suspect as a Caucasian or Hispanic man in his late 20s, between 5 ft. 8 in. and 6 ft. tall, weighing around 150-160 lbs. Anyone with information regarding these home invasions should contact Area North detectives at (312) 744-8263.